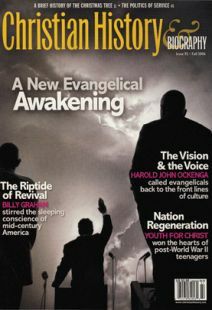 Editor's note: The Fall 2006 issue of Christian History & Biography tells the story of the New Evangelicals. This vibrant, mid-20th-century movement eagerly sought active engagement in the culture, the application of Christian truth to society's problems, and the spread of biblical, historic Christianity throughout the world. From those early days, Billy Graham emerged as one of the movement's foremost leaders, as this article from the issue describes. The next day, the two Hearst papers in Los Angeles gave Graham and the revival banner headlines, and 12 other papers in the chain also gave the campaign extensive coverage. Within days, the Associated Press, the United Press, and the International News Service picked up the story, and Time, Newsweek, and Life followed suit soon afterward. On the train back to Minneapolis when the revival had finally ended after eight weeks, conductors and passengers treated him like a hero, and reporters crowded on board to press their inquiries. Billy Graham had become a national figure. Although he had not been a party to the 1942 founding of the National Association of Evangelicals, Graham's efforts on behalf of Youth for Christ had introduced him to legions of people who were or would become leaders in that movement. Now, through his crusades and the attention they could draw, it seemed possible that he could play a significant role in helping the movement reach out to the larger culture. Eventually, no figure came to represent the spirit of the New Evangelicalism more fully than Billy Graham. Born in Charlotte, North Carolina, on November 7, 1918, and reared on a dairy farm in a strict Calvinist household, Graham had occasion to hear numerous itinerant revivalists. Some of them stayed in his home and sowed the first seeds of interest in a preaching career. Graham attended Bob Jones College briefly, Florida Bible Institute (where he began preaching and changed his denominational affiliation from Associate Reformed Presbyterian to Southern Baptist), and Wheaton College (where he met and married Ruth Bell, the daughter of a medical missionary, and undertook his first and only stint as a local pastor). He became the field representative for Youth for Christ International in 1945, and by the fall of 1948 he and his new music director, Cliff Barrows, were devoting most of their time and energy to Graham's revival campaigns. After the success of Los Angeles, Graham opened the year 1950 with a little-heralded campaign in Boston. Despite his newfound fame, the leaders of the Evangelistic Association of New England felt the machine-gun pace and theatrical style of his preaching might be too intense for a Boston audience and decided to sponsor only one service, on New Year's Eve. Harold John Ockenga had once refused a request by YFC to have Graham hold a rally in 1947, primarily because at that point he knew nothing about Graham and was disinclined to throw his prestige behind an untested southern Bible school preacher with a penchant for loud suits and hand-painted ties. Now he agreed to let him preach for 10 days at Park Street Church. To the surprise of all, the New Year's Eve service drew 6,000 people. An impromptu service the next afternoon filled the building again, and the scheduled service that evening packed every available space at Park Street and left more than 2,000 people frustrated because they could not get in. This response both exhilarated and terrified Graham, moving him to call Ockenga and prominent layman Allan Emery Jr. into a room and ask them to pray “that the Lord will keep reminding me of the fact that this is all of grace and to Him is all the glory, because I realize if I take the smallest credit for anything that has happened so far, that my lips will turn to clay.” The announced run of 10 days stretched to 18, and swelling crowds necessitated moves to larger venues, winding up in Boston Garden with a climactic service that drew more than 25,000, of whom 10,000 were turned away. Against strong urging and his own instincts, Graham left Boston to keep commitments elsewhere, most notably in South Carolina, where he forged friendships with then-governor Strom Thurmond and Time-Life publisher Henry Luce. He then returned to New England for a 16-city tour of the region, once again to extravagant press coverage. Other developments in 1950 would have even greater lasting effects than those of the triumphant New England and southern meetings. Within a few months of its founding, Graham's new Sunday afternoon radio show “The Hour of Decision” was attracting the largest audience the Nielsen rating service had ever recorded for a religious broadcast and was being heard on nearly 1,000 stations in the United States and at least 30 shortwave stations worldwide. In 1951, Graham filmed Mr. Texas, the first in a long series of motion pictures that would serve as effective evangelistic tools. The new media ministry, with the tremendous response it generated, required a more formal organizational structure, leading to the establishment of the Billy Graham Evangelistic Association. The BGEA was headquartered in Minneapolis from 1950 until 2005, when it was moved to Charlotte, North Carolina. In 1954, Graham held a 12-week crusade in London's Harringay Arena that cemented his already growing international reputation. Immediately afterwards, he and his associates went on a whirlwind tour of European cities, preaching to overflow throngs in Stockholm, Copenhagen, Amsterdam, and Berlin. The following year he returned to the United Kingdom for a successful campaign in Scotland and a whistle-stop tour of a dozen cities on the Continent. He then extended his reach to India, preaching to crowds estimated at more than a hundred thousand. Billy Graham would have other continents to conquer, and his fame and influence in America were still far from their peak. But in less than a decade since his 1949 triumph in Los Angeles, he had clearly emerged as the acknowledged standard-bearer for the New Evangelicals. The dynamic preaching that drew people to his crusades and glued them to their radios was undergirded by a growing reputation for integrity and a determination to use his influence to strengthen evangelical Christianity. This was seen in his strong support of Fuller Theological Seminary and his founding in 1956 of Christianity Today, which quickly became the most widely read serious religious journal in the nation. His stature was enhanced by his ability to forge friendships with powerful people, most notably President Dwight Eisenhower and his vice-president, Richard Nixon. Evangelicals understandably relished the fact that the most famous representative of their brand of Christianity was welcomed by and at home with the most powerful leaders in the free world. "A Brotherhood That Transcends Color"
A signal triumph came in 1957 when Graham preached from Memorial Day to Labor Day in New York City, filling Madison Square Garden night after night throughout the summer and winding up with a climactic service that filled Times Square and up Broadway's urban canyon. Once again, the numbers were impressive—total attendance above 2,000,000, with 55,000 recorded decisions for Christ—but the New York meeting was an evangelical milestone in other respects as well. Leaders of the New Evangelical movement had urged evangelicals to revive the 19th-century practice of active involvement in social reform. Graham had not only spoken out on the major domestic issue of the time, racial segregation, but since the early 1950s had refused to allow segregated seating in his meetings. He went a step further in New York, persuading a young African American preacher, Howard Jones, to join his team as an associate evangelist. The words did not explicitly endorse King, and King's prayer called for nothing more revolutionary than “a brotherhood that transcends color,” but the implication was unmistakable: Graham was letting both whites and blacks know that he was willing to be identified with the revolution and its foremost leader, and King was telling blacks that Graham was their ally. Graham would never feel comfortable with Dr. King's confrontational tactics; still, his voice was important in declaring that a Christian racist was an oxymoron. This action led many southerners to turn against Graham, but he did not waver. Instead, he subsequently traveled to Birmingham, Little Rock, and other strife-torn cities in the South, calling on Christians to recognize that the ground at the foot of the cross is level and that God is no respecter of persons. Many southerners who were offended by Graham's actions eventually came to see he had been right and repented of their attitudes and actions. Another segment of dissenters, however, hardened their opposition to him. For several years prior to the New York crusade, hard-line fundamentalists led by Carl McIntire, Bob Jones, and John R. Rice had grown uneasy with Graham's apparent comfort with Christians who fell short of meeting their rigid standards of theological orthodoxy. When Graham accepted the invitation to hold a crusade in New York from the broadly representative Protestant Council of Churches, aligned with both the National and World Councils of Churches, fundamentalists attacked him in repeated editorials and articles in their publications. Graham's appeal to peace and harmony among Christians, they growled, was just the sort of thing to expect from a man who had gone soft on doctrine. Following that episode, McIntire, Jones, Rice, and others of their ilk regarded Graham as no longer one of their own. The New York crusade did not cause the division between the old fundamentalists and the New Evangelicals; that had been signaled by the nearly simultaneous founding of the NAE and McIntire's American Council of Christian Churches 15 years earlier. But it did provide an event around which the two groups were forced to define themselves. William Martin is Senior Fellow for Religion and Public Policy, James A. Baker III Institute for Public Policy, Rice University. Henrietta Mears loved hats, college students, and the boundless possibilities of Christian ministry. Harold John Ockenga's conviction that the church needs thinkers helped spark a renaissance of evangelical scholarship. The New Evangelicals called for a fresh application of Christian truth to the social problems of the day.